Television Critics Association Press Tour, Los Angeles, CA, July 22, 2012 – A new generation of preschool “neighbors” will get to experience the Neighborhood of Make-Believe when Daniel Tiger’s Neighborhood premieres this fall on PBS KIDS. The first TV series inspired by the iconic, award-winning Mister Rogers’ Neighborhood, Daniel Tiger’s Neighborhood from The Fred Rogers Company stars 4-year-old Daniel Tiger, son of the original program’s Daniel Striped Tiger, who invites young viewers into his world, giving them a kid’s-eye view of his life. As they closely follow and share Daniel’s everyday adventures, preschoolers ages 2-4 and their families learn fun and practical strategies and skills necessary for growing and learning. Daniel Tiger’s Neighborhood premieres Monday, September 3, on PBS KIDS with a special one-hour block of two back-to-back episodes. The series will air daily following its Labor Day premiere (check local listings). Recent research proves what Fred Rogers knew all along: social and emotional competencies are the building blocks of doing well in school and in life. To help boost these invaluable skills among preschoolers, each episode of Daniel Tiger’s Neighborhood consists of two engaging stories that center on a common early learning theme such as dealing with disappointment. One of the key ingredients that sets the new series apart is its groundbreaking use of catchy, musical strategies that reinforce each theme and that preschoolers and parents will both sing – and use! – together in their daily lives. Every story includes an “imagination moment” in which Daniel plays out a preschool fantasy set to music. Then, the day’s strategy is reprised in a full song at the end. Daniel Tiger talks directly to viewers, warmly drawing them in and making them feel like one of his neighbors. The series’ stories are based on extensive input from a wide range of early learning specialists, formative research with children and the benefit of more than 40 years of the work of Fred Rogers. It all adds up to a powerful tool for parents: an entertaining and thoughtful guide for today’s families that integrates music, interactivity and a research-based curriculum. Daniel Tiger’s Neighborhood brings together some of today’s top creators of quality children’s media. Angela C. Santomero, of leading production partner Out of the Blue Enterprises and the imaginative force behind Super WHY and Blue’s Clues, has provided the outstanding creative vision for the new series. Santomero and Kevin Morrison of The Fred Rogers Company are executive producers of the show, which is animated by award-winning 9 Story Entertainment. Game designer Schell Games will help extend the new show and its positive messages far beyond the TV screen with exciting online games. Daniel starts his day by donning his red sweater, tying his sneakers and inviting his preschool pals at home into the bright and lively Neighborhood of Make-Believe. Daniel Tiger’s Neighborhood features the next generation of the original characters from Mister Rogers’ Neighborhood. Daniel’s best friend is O the Owl, who lives with his Uncle X in the tree next door to Katerina Kittycat, daughter of Henrietta Pussycat. Daniel also loves to visit Prince Wednesday, the youngest member of the royal family headed by King Friday, in his castle; and Miss Elaina, who lives with her parents, Lady Elaine Fairchilde and Music Man Stan, in the Museum-Go-Round. The familiar red trolley “ding dings” its way all around the Neighborhood. The series will be accompanied by interactive content for young viewers, their parents and teachers. A robust Daniel Tiger’s Neighborhood website will launch on Monday, August 6, featuring online games that will offer preschoolers a chance to ride through the Neighborhood on Trolley, pick up Daniel and his friends to give them a ride, and further explore Daniel’s world and his daily routines. Through game play, preschoolers will build on the skills covered in the series by actively engaging in pretend play activities with Daniel, exploring routines such as bedtime and bath time, expressing feelings and creativity through music and art and modeling positive relationships and appreciation for others. Online resources for parents, caregivers and teachers also will be available to complement each episode. 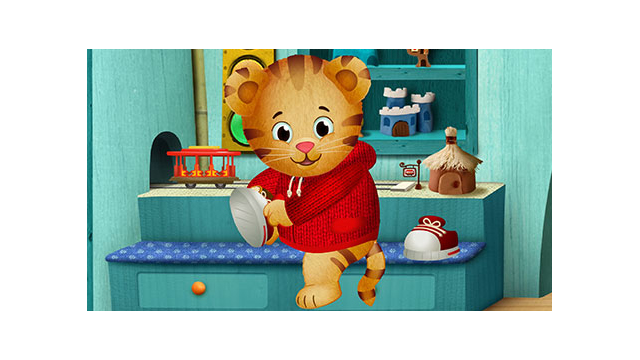 Daniel Tiger’s Neighborhood joins PBS KIDS’ lineup of media properties for kids ages 2 to 8, which includesThe Cat in the Hat Knows A Lot About That!, Curious George, Sesame Street and Wild Kratts, among other top-rated series. PBS KIDS programs consistently rank #1 with moms and in the top five with preschoolers*, and PBSKIDS.org is the #1 kids’ site for videos viewed (comScore VideoMetrix, June 2012). With a variety of educational media content across platforms, PBS KIDS is increasingly serving children wherever they live, learn and play. Over the course of more than 40 years, Mister Rogers’ Neighborhood, PBS’ longest-running children’s series, earned four Daytime Emmys. As a testament to his legacy, Fred Rogers received a Lifetime Achievement Award in 1997 and was recognized in 2002 with a Presidential Medal of Freedom, the nation’s highest civilian honor, for his contributions to children’s development and education using broadcast television. Images, episode descriptions and additional press materials for Daniel Tiger’s Neighborhood are available here. *Source: Nielsen NPower, Live+7 Days national GAA ratings for PBS and select competitive cable networks. Ratings are ranked monthly in the “PBS Top Rated Kids Programs and Monthly Highlights Report” October 2010–March 2012 About PBS KIDS PBS KIDS, the #1 educational media brand for kids, offers all children the opportunity to explore new ideas and new worlds through television, online and community-based programs. For more information on specific PBS KIDS programs supporting literacy, science, math and more, visit PBS.org/pressroom, or follow PBS KIDS on Twitter and Facebook. About The Fred Rogers Company The company was founded by Fred Rogers in 1971 as the non-profit producer of Mister Rogers’ Neighborhood for PBS. In the years that followed, it not only created hundreds of episodes of this much-loved program, but also extended Fred’s values and approach to other efforts in promoting children’s social, emotional, and behavioral health and supporting parents, caregivers, teachers and other professionals in their work with children. The Fred Rogers Company continues to build on Fred’s legacy in innovative ways through a wide variety of media, and engaging new generations of children and families with his timeless wisdom. For more information, visit us at www.fredrogers.org.